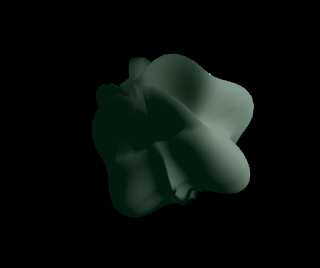 Getting closer on properly re-calculating the normals after radial deformation in GLSL. 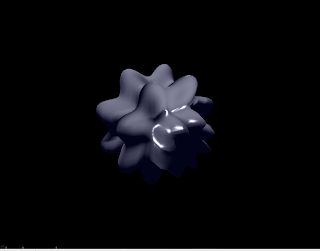 To recap, I built a radial deformer like a jellyfish or spore type form when applied to a sphere. While displacing vertices is fairly easy, re-calculating the normals has been tricky. The visual appearance is getting very close to the phong-shaded deformed sphere I'm shooting for.. However it still isn't perfect. - Don't normalize any vectors in Spherical coordinates. Since they're measuring angles & radius, a normalization doesn't make sense. This was causing all kinds of crazy problems. - Cartesian-to-spherical function modified to check for bounds of asin and check hemisphere for atan. Holes in mesh have been fixed. - Now using the proper built in GLSL matrix functionality. With this method, the shading/highlights still don't look perfect when deformed. I'm almost positive that the culprit is my Jacobian matrix, since when the deformation amount is zero, the object looks perfect: In other words, when the deformation is zero, the whole process of renormalization is still happening, but just coming out identical to the inputs. I'm wondering if my method of simply replacing x,y,z with r,t,p in the Jacobian is legit.. Maybe I have to convert the functions somehow. More reading to come.. 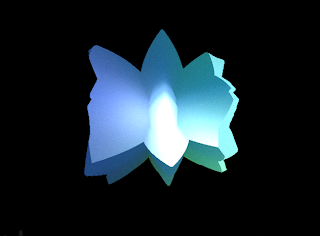 I began to implement the second part of the GLSL mesh deformer. This part was all about recalculating the surface normals after procedurally moving the vertices of the model. Following the directions provided at this link I was able to perform the steps to calculate a Jacobian matrix based on the original deformation forumla. Using this matrix I was able to correct the surface normals post-deformation.. sort of. With this method, I think I got very close to the desired effect of perfectly deformed surface normals to go along with the deformed mesh. However visually there are still some problems. I believe the cartesian-to-polar function has some discontinuities that result in holes in the mesh. Also the shading looks off in some way, possibly related to the double coordinate system translation being slightly off. But its getting closer! 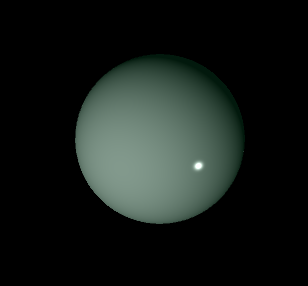 Here's the vertex shader as it stands.. 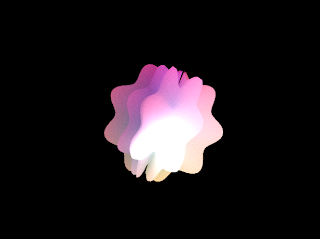 I'm finally getting deeply into the world of GLSL and learning what can be done with it. I wanted to implement a mesh deformation shader that I could control with an audio signal. 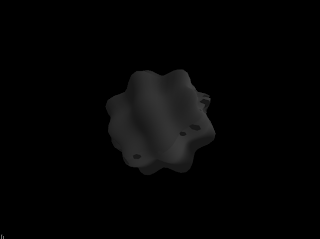 Inspired by sea anenomaes and spore-like forms, I decided to create a radial deformation. This deformation shader program works as follows: For each vertex I would take XYZ, and convert that to 3D radial coordinates (r, theta, phi). From there, I could push the point's radius outward, as a function of the two angles theta and phi. Then, converting back into the XYZ space, pass these new coordinates into a fragment shader. The model pictured is a simple sphere, loaded as a VBO. 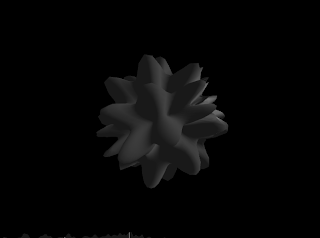 The sphere is great for testing a deformer like this, because it shows a very pure representation of the deformation itself. I pass FFT values of an incoming audio signal into the vertex shader from Java, which control displacement amount, frequency, progression of time, etc. I can get 400 FPS with about 50k polygons on the object... With the complex deformation.. Pretty good I'd say. The problem I quickly discovered is that although the vertices are easy to displace in this manner, their normals retain the original direction from when the model was a simple sphere. So, to get the proper shading and specular highlights, each vertex's normal must be recalculated along with its new position. Thankfully, people a lot smarter than me have already encountered and solved this problem. Although the solution is not exactly simple to impliment, it is somewhat straightforward. I found this link explaining it very well. Basically the idea is to take your deformation function and calculate some partial derivatives of it. Using these new functions, you can calculate a new transformation matrix to convert your original normals into the new proper normals reflecting the deformed object. Here's the vertex shader program as it stands... This version does not recalculate the normals after deformation. This blog will contain information and adventures related to advanced graphics coding, leaning toward abstract visuals, visuals for music, and VJ performance. Topics will cover, GLSL shaders, Audio Reactive, VBOs, animation, Generative Forms, Color Theory, Live Performance, and beyond.. Even if this is just for me, it will be worth the time to document ideas and progress.